New kids on the block Gorilla Themes have released the monster wordpress theme Tribal. Mixing the dirty grunge theme feel with urban graff overtones this theme delivers in both looks and functionality. Tribal has been developed to be used by anyone wanting to promote heavily within the music industry. It is intended to be used by artists, bands, record labels, radio stations, reviewers and industry news. With a little imagination though it could be used and developed for so much more. Using the latest technology available the home page of this site presents your visitors with a nice and dynamic featured content section (jQuery) with full slide show of all your latest news / posts. This would look at home on any flash site but harnesses the power of wordpress and jQuery to be nice and SEO friendly, more importantly though it is simple to use with just a few options in the admin. The first thing your visitors will notice however is the beautiful jukebox style music player, here you can really show off with album art, as many tracks as you want played and minimal controls making for very easy use. This is one of the best music players on the web at the moment and its built into your theme! Jukebox music player with album art. This music wp theme also has a built in flash titles system which renders all your article headers in the themes grunge font keeping everything in style and looking one step ahead of your competitors (and still SEO friendly!). Tribal also has a built in system for auto sizing your images and avoids the use of custom fields for ease of use. With adsense built in (if you want it), feedburner, subscribe options (so you can quickly build a mailing list ), and search engine friendly design, this is a strong business orientated website masquerading as an urban graff street theme. 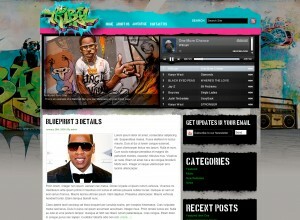 Any hip-hop or similar label should be proud to have this as there front of house marketing portal. It can also be developed very easily to suit any branding. We recommended Tribal very strongly if you are serious about expanding and promoting your business. 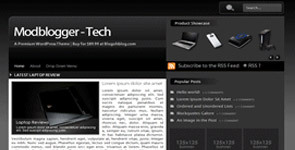 this is a premium technology based wordpress theme. If you love gadget and technology websites as much as we do and have ever wanted to run your own then this could be the site for you! Not sure? Take a look at some of our favourite sites on the net for some inspiration Notcot, OhGizmo!, Boing Boing Gadgets, Gizmondo and Ektopia. The basics are also all there to run a games blog or review site. There’s also an area for 125 x 125 ads so you can monetize you blog, and with a technology blog or site there’s plenty of opportunity to advertise. Complete demo of the site is availible from the homepage (link below) and it is worth checking out before you make a decision. Blog Oh Blog offer complete support after purchase and are well known for quality in both code and style.